We offer several methods of anesthesia, ranging from local anesthesia (“Novocaine”) to general anesthesia (“completely asleep”). The method of anesthesia that is chosen for or by a patient depends upon the nature of the surgical procedure, the patient’s medical history and physical exam, and the patient’s level of apprehension. When it comes to anesthesia, our first priority is patient comfort and safety. If you have any concerns regarding the type of anesthesia that will be administered during your surgical procedure, please do not hesitate to discuss your concerns with Dr. Conquest at the time of your consultation. Local anesthesia can be used alone or in combination with other anesthesia modalities. When using local anesthesia alone the patient will remain totally conscious throughout the procedure. A local anesthetic (e.g. lidocaine) is administered in the area where the surgery is to be performed. This local anesthetic will numb the area to be treated and will typically last for four to six hours. Simple oral surgery procedures such as minor soft tissue biopsies and routine tooth extractions can usually be performed with local anesthesia alone. The depth of sedation can be altered at any time to increase or decrease your sedation. Nitrous oxide is safe with no lasting side effects. Nitrous oxide works rapidly as it reaches the brain within 20 seconds. In as few as 2-3 minutes its relaxation and pain killing properties develop. Nitrous oxide (laughing gas) is very safe but it should not be used if you have emphysema, intestinal obstructions, air bubbles in the eye, exotic chest problems, a cold, or other difficulties with breathing. 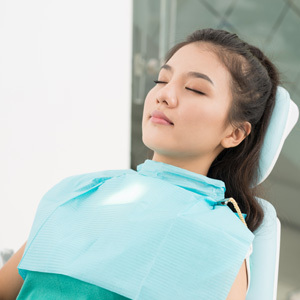 Oral sedation involves taking medication by mouth prior to your appointment and can be used in conjunction with other anesthesia techniques. Depending on the medication, the dose, and your bodies metabolism oral sedation can range from minimal to moderate levels. For oral sedation, you take medication one hour prior to your appointment. To help control your anxiety Dr. Conquest may also prescribe this same medication to be taken at bedtime and first thing in the morning on the day of your procedure. In some cases, particularly with children, oral sedation medication may be given in the office. Oral sedation medication may decrease your anxiety level, making you feel relaxed and drowsy. Some patients become groggy enough from oral sedation to actually fall asleep during the procedure. You will need a driver and can have nothing to eat or drink for six hours prior to your appointment when receiving oral sedation. Intravenous sedation or “IV sedation” is a moderate sedation technique that will alleviate the anxiety associated with your treatment and allow you to undergo your surgical procedure in a very relaxed state. IV sedation enables you to tolerate as well as not remember those procedures that may be uncomfortable for you. You may not always be asleep but you will be comfortable, calm and relaxed, drifting in and out of sleep – a “twilight sleep”. To administer IV sedation an IV is started in your arm or hand and is connected to a bag of sterile IV fluid. Medications are then administered through the IV line to help you relax and feel comfortable. Once again some patients may be asleep while others will slip in and out of sleep. With IV sedation a constant “drip” is maintained via the intravenous tube. At any time sedation can be increased with additional medication or an antidote can be administered to reverse the effects of the medications if necessary. Supplemental oxygen is delivered through a nasal cannula and the patient’s vital signs are closely monitored. You will need a driver and can have nothing to eat or drink for eight hours prior to your appointment when receiving IV sedation. Some patients with medical conditions and/or on specific drug regimens may only be lightly sedated and may not sleep at all. We offer general anesthesia for all types of oral surgery procedures. Most patients having their wisdom teeth removed, a bone graft performed, or a dental implant placed will choose general anesthesia. A patient may also choose general anesthesia for simple procedures depending on their level of anxiety. In some situations general anesthesia may be necessary. For example, when local anesthesia fails to anesthetize the surgical site which often occurs in the presence of infection. To administer general anesthesia medications are administered through an intravenous line (I.V.) or by face mask. The patient then falls asleep and is completely unaware of the procedure being performed. While asleep supplemental oxygen is delivered through a nasal cannula and the patient’s vital signs are closely monitored. You will need a driver and can have nothing to eat or drink for eight hours prior to your appointment when receiving general anesthesia. If you choose one of the above listed options your sedation/anesthesia is administered and monitored by Dr. Conquest therefore eliminating the costly expense of having your treatment carried out in an operating room or same day surgical facility. You may require admission to a hospital or a surgery center for your procedure where anesthesia is administered by an anesthesiologist. This treatment setting is indicated for patients undergoing extensive surgical procedures such as jaw reconstruction or orthognathic surgery. Hospital admission and the assistance of an anesthesiologist may also be indicated for patients with medical conditions such as heart disease or lung disease who require general anesthesia.